Acer's Aspire range is its consumer line, and the Aspire 5536-643G50Mn (£499 inc. VAT) is fairly well specified with a widescreen panel, impressive storage and long battery life, although performance is slightly disappointing. The 2.7kg chassis is nice and light and suits basic travel use. This is helped by a 166-minute battery life. This falls short of the three-hour minimum we expect, but still betters many rivals. Build quality is excellent, with strong plastics used throughout. The textured silver plastic and glossy blue lid give the appearance of a high-end media centre, but the lid quickly attracts scratches and fingerprints. A large fan on the rear ensures the chassis stays cool at all times. Usability is outstanding and the large keyboard features an unusual style. All the keys are raised above the chassis with large gaps between them. While this adds a stylish look, dirt can easily fall underneath the keys. The board is firmly fixed, however, and quiet in use. The large touchpad is equally usable, and its use of gesture controls lets you zoom into photos by pinching your fingers together on the pad. The single dual-click mouse button is less practical, however. You have to click in specific areas for it to register, which provides awkward usability. The use of a 15.6-inch screen panel is rare at this price. Its 16:9 widescreen aspect ratio makes it ideal for watching movies and viewing multiple documents side by side. Brightness, colour and contrast are all excellent. Storage is also outstanding. The 500GB hard drive provides comprehensive space for your music, video and photo collections, while the dual-layer DVD rewriter lets you save files to DVD and CD. Finally, the integrated 5-in-1 card reader provides support for the most popular flash card formats. 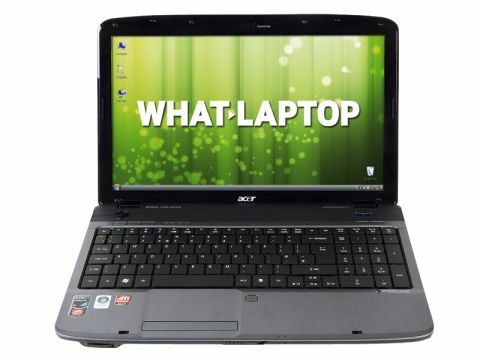 Despite its dual-core AMD processor and 3072MB of memory, the Acer falls slightly short when it comes to performance. While we were able to run multiple applications fairly smoothly, the MSI and Toshiba proved much faster in daily use. Graphics performance is more capable, but bettered by the MSI VR705 and the Samsung R505. The ATI graphics card smoothly processes HD video and also provides ample power for basic photo and video editing. Only the most basic gaming is possible, however. Despite its limited performance, the Aspire 5536-643G50Mn is stunning value for money. Its stylish design, vibrant widescreen panel, impressive specification and great usability make it hard to fault. At such a low price, this is a truly fantastic laptop for the home or office.